Adenomatoid odontogenic tumor (AOT) is considered to be an uncommon odontogenic tumor which occurs most commonly in an unerupted maxillary canine. Some investigators consider it to be a benign neoplasm, while others consider it to be a hamartomatous malformation due to its limited size and to the lack of recurrence in most of the cases. The specific stimulus that triggers proliferation of progenitor cells of AOT is unknown, as in case of all odontogenic tumors. As it is exclusively associated with an unerupted or impacted tooth and the cytological resemblance to the dental lamina and enamel organ, it can be considered as odontogenic in origin. 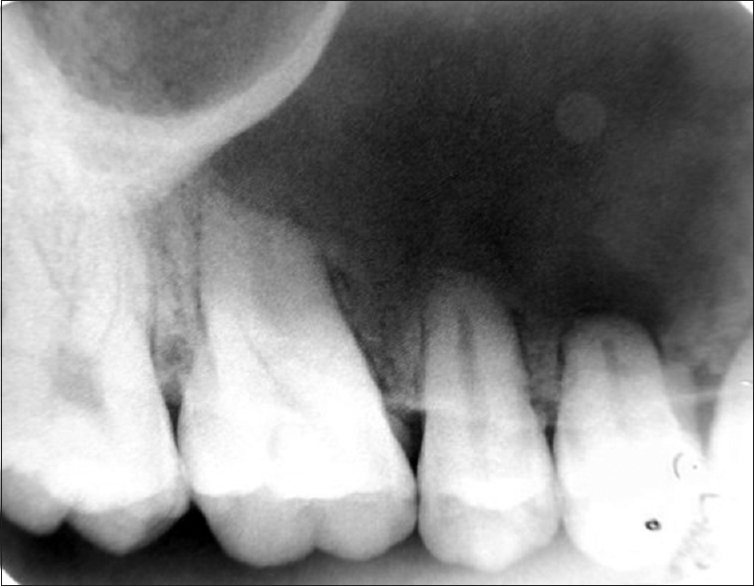 The present case highlights the unusual presentation of AOT which is not associated with an impacted or unerupted tooth. Adenomatoid odontogenic tumor (AOT) represents 3% to 7% of all odontogenic tumors, and more than 750 examples have been reported in the literature. Although this lesion was formerly considered to be a variant of the ameloblastoma and was designated as “adenoameloblastoma,” its clinical features and biological behavior indicate that it is a separate entity. In 1969, Philipsen and Birn proposed the widely accepted and the currently used name AOT. In 2005, the histological typing of the World Health Organization defined AOT as a tumor composed of odontogenic epithelium, which presents a variety of histoarchitectural patterns, embedded in mature connective tissue stroma, and characterized by slow and progressive growth. The purpose of this article is to report an unusual case of AOT located in the maxilla which is not associated with an unerupted or impacted tooth, with an emphasis on radiographic findings and with pathologic correlation, and to review the existing literature on this tumor. 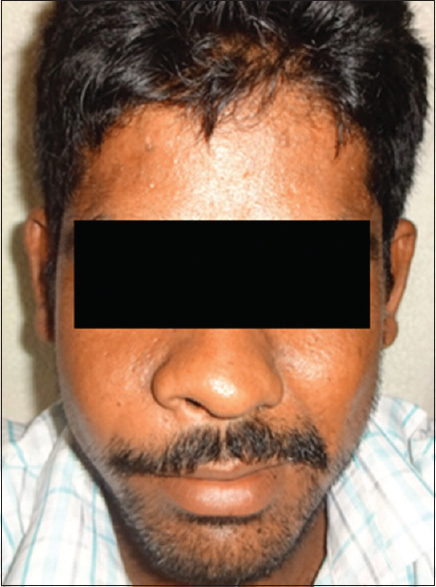 A 29-year-old male reported with swelling in relation to the right-side middle-third face for the past 2 months. The patient was asymptomatic 2 months back when he noticed a swelling in relation to the right-side middle-third face which progressively increased in size to attain the present size. The swelling was asymptomatic with no history of nasal stuffiness or nasal discharge. There was no history of trauma to that region. His medical history was not significant and he had no history of harmful habit. This was his first dental visit. 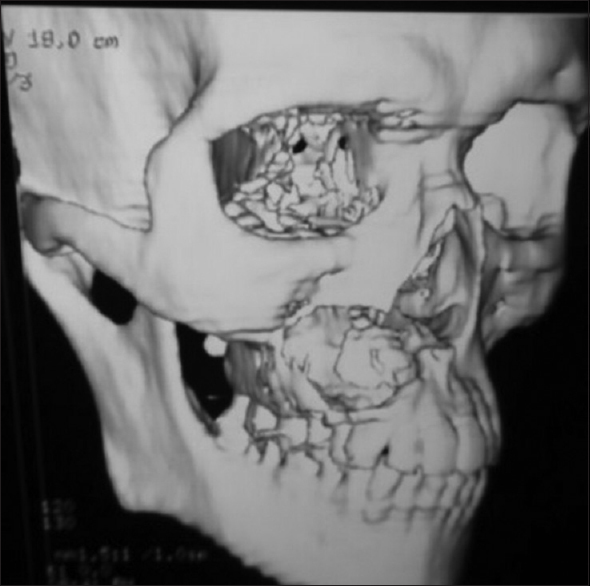 A diffuse swelling of size approximately 3 cm × 3 cm was present in the right middle-third face extending superoinferiorly from the infraorbital rim to the corner of the mouth. Medially, the swelling extended up to the philtrum and laterally in line with the outer canthus of the eye. The skin over the swelling appeared normal with no evidence of secondary changes such as ulceration, sinus opening, or pus discharge [Figure 1]. On lymph node examination, a single left submandibular lymph node of size approximately 1 cm was palpable, which was soft-firm, mobile, and nontender. On intraoral examination, a single swelling of size approximately 3 cm × 3 cm was present in relation to the right maxilla extending anteroposteriorly from the mesial aspect of 11 to the mesial aspect of 16. The palatal extension was 1 cm short of midpalatal raphae, and the swelling obliterated the buccal vestibule from 11 to 16. The mucosa over the swelling appeared normal with no evidence of secondary changes. On palpation, the inspector findings were confirmed. The swelling was firm to hard in consistency on the palatal aspect and soft to firm in consistency labially with tenderness on palpation [Figure 2]. Intraoral periapical radiograph in relation to 11, 12, and 13 revealed a well-defined homogeneous radiolucency extending from the periapical region of 11 to the mesial aspect of 14, and the complete extent was not covered [Figure 3]. 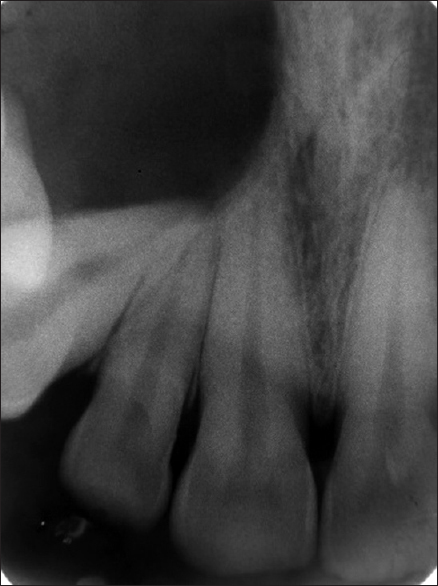 Intraoral periapical radiograph in relation to 13, 14, and 15 revealed a well-defined corticated unilocular homogeneous radiolucency extending from the mesial of 13 to distal of 15 with the displacement of 13 and root resorption in relation to 14 and 15 [Figure 4]. Maxillary cross-sectional occlusal radiograph revealed a well-defined corticated unilocular homogeneous radiolucency extending from the mesial of 11 to distal of 16 with buccal and palatal cortical expansion. Digital orthopantomogram revealed a well-defined corticated unilocular homogeneous radiolucency extending from the mesial of 11–17 with root resorption in relation to 14, 15, and 16. The floor of the right maxillary sinus could not be traced [Figure 5]. Computed tomogram axial bone window revealed a hypodense area involving the right maxilla with expansion of buccal cortical plate [Figure 6]. There was thinning of the buccal cortex with focal areas of destruction. Computed tomogram coronal bone window revealed a hypodense area involving the right maxilla with expansion of buccal and palatal cortical plate and lifting of the floor of the maxillary sinus. Computed tomogram three-dimensional reconstruction revealed cortical perforation and complete destruction in relation to the anterior wall of the maxillary sinus [Figure 7]. On the basis of history and clinical presentation, a provisional diagnosis of developmental odontogenic cyst most likely odontogenic keratocyst in relation to the right maxilla was given. The differentials included radicular cyst, dentigerous cyst, benign odontogenic tumors such as ameloblastoma and AOT, odontogenic myxoma, reactive lesions such as central giant-cell granuloma, central ossifying fibroma, and malignancies such as central mucoepidermoid carcinoma. Thermal and electric vitality test revealed immediate response in relation to 21, delayed response in relation to 11 and 12, and no response in relation to 13, 14, 15, 16, and 17. On lesional aspiration, 5 ml of amber-colored fluid was obtained. Routine hemogram was within normal limits. Excisional biopsy was done, and the specimen was sent for histological investigation. 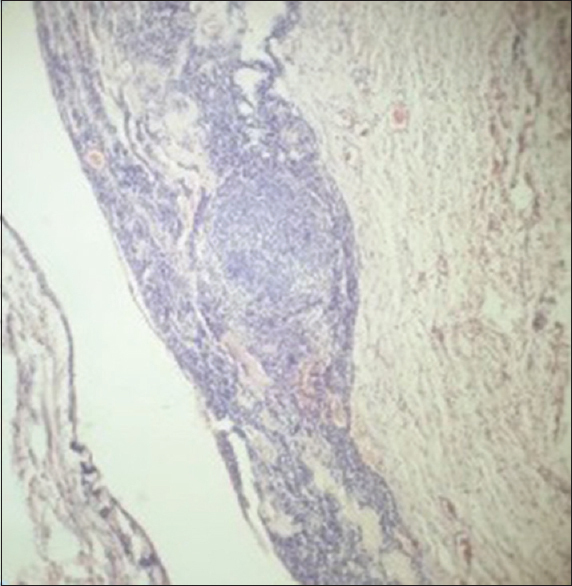 Histologic investigation revealed a well-defined capsule and odontogenic epithelium which appeared in the form of strands and nodules and gives a whorled appearance, and there was calcification in some areas suggestive of AOT [Figure 8]. AOT is a slow-growing lesion, constituting about 3% of all odontogenic tumors followed by odontoma, periapical cemental dysplasia (cementoma), myxoma, and ameloblastoma. They are largely limited to young patients, and two-thirds of all cases are diagnosed when the patients are 10–19 years of age. This tumor is definitely uncommon in a patient older than 30 years. The tumor is most often diagnosed in the second decade of life, and women are about twice as many affected than men. AOT is over two times more located in the maxilla than in the mandible, and the anterior jaw is much more affected than the posterior area. These features are consistent with our present case except the gender variability where we have reported a young male. According to Philipsen and Reichart, AOT appears in three clinicotopographic variants: follicular, extrafollicular, and peripheral. The follicular and extrafollicular variants are both intrabony and account for approximately 96% of all AOTs of which 71% are of follicular type. The tumor is usually associated with unerupted teeth, frequently canines. However, in our case, there were no clinically missing teeth. Radiographically, the periphery usually appears as a well-defined corticated or sclerotic border with internal radiopaque foci in two-thirds of the cases. One tumor may be completely radiolucent, another may contain faint radiopaque foci, and some may show dense clusters of ill-defined radiopacities although few multilocular cases have been reported., Radiographically, it should be differentiated from dentigerous cyst, which most frequently occurs as pericoronal radiolucency in the jaws. Root resorption is rare as the tumor enlarges and the adjacent teeth are displaced., In the present case, there was a well-defined homogeneous radiolucency without any calcific spots surrounded by a sclerotic border. Surprisingly, there was no evidence of any impacted teeth. Furthermore, there was severe resorption of the roots of premolars which is an unusual characteristic of AOT. AOT shows centrifugal expansion (uniform expansion in all directions). It has been hypothesized that at an early stage, AOT may expand the cortical plates, which within the cancellous bone spread linearly and then later may affect the cortical plates by expansion/resorption. Bicortical expansion was seen in our patient. The histological findings for AOT reported in the literature reveal a remarkable similarity.,, The histological features of the tumor were described as a tumor of odontogenic epithelium with duct-like structures and with varying degree of inductive changes in the connective tissue. The tumor may be partly cystic, and in some cases, the solid lesion may be present only as masses in the wall of a large cyst. The tumor may contain pools of amyloid-like material and globular masses of calcified material. In our case, the histology was suggestive of well-defined capsule and odontogenic epithelium which appeared in the form of strands and nodules and gives a whorled appearance. In some areas, calcification was noted. Furthermore, the unusual presentation of AOT which is not associated with any impacted or unerupted tooth has been reported. A similar case had been reported by Reddy Kundoor et al. in a 50-year-old male which explains the unusual aggressiveness of AOT. Surgical excisional has been done, and the patient is under regular follow-up without showing any recurrence. With respect to the presentation of the lesion which is not associated with any impacted or unerupted tooth and because of its aggressive nature, our case is a rare case of AOTs. AOT is commonly referred to as “two-third tumor,” but it does not mean that the tumor is restricted only to the two-thirds and some rare presentations do occur as in our present case. Thus, we conclude that AOT should be considered as the differential diagnosis even for the aggressive lesions of the maxilla even if there is no evidence of clinically missing teeth. Neville BW, Damm DD, Allen CM, Bouquot JE. Oral and Maxillofacial Pathology. 3rd ed. Philadelphia: Saunders; 2009. p. 713-5. Philipsen HP, Birn H. The adenomatoid odontogenic tumour. Ameloblastic adenomatoid tumour or adeno-ameloblastoma. Acta Pathol Microbiol Scand 1969;75:375-98. Sharma N, Passi S, Kumar VV. 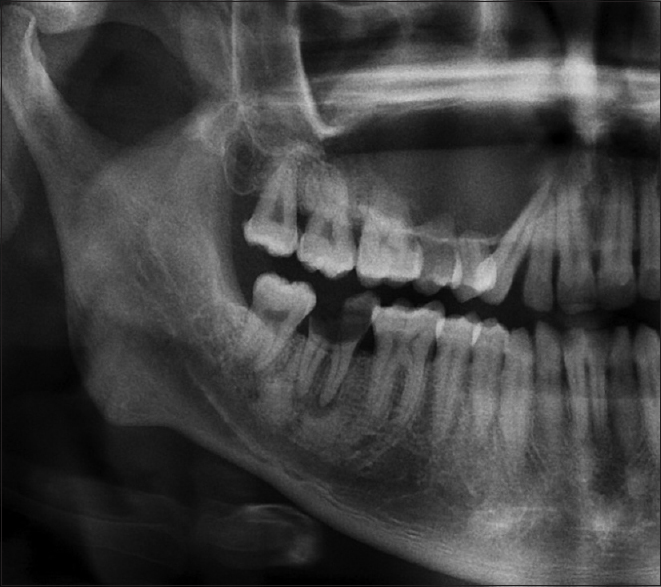 Adenomatoid odontogenic tumor: As an unusual mandibular manifestation. Contemp Clin Dent 2012;3:S29-32. Garg D, Palaskar S, Shetty VP, Bhushan A. Adenomatoid odontogenic tumor – Hamartoma or true neoplasm: A case report. J Oral Sci 2009;51:155-9. Baskaran P, Misra S, Kumar MS, Mithra R. Adenomatoid odontogenic tumor – A report of two cases with histopathology correlation. J Clin Imaging Sci 2011;1:64. Kumar AC, Reddy J, Gupta S, Raghav N, Bagga M. An unusual site of adenomatoid odontogenic tumor presenting as a periapical cyst: A rare case report. J Indian Acad Oral Med Radiol 2010;22:39-4. Handschel JG, Depprich RA, Zimmermann AC, Braunstein S, Kübler NR. Adenomatoid odontogenic tumor of the mandible: Review of the literature and report of a rare case. Head Face Med 2005;1:3. Philipsen HP, Reichart PA. Adenomatoid odontogenic tumour: Facts and figures. Oral Oncol 1999;35:125-31. Dayi E, Gürbüz G, Bilge OM, Ciftcioǧlu MA. 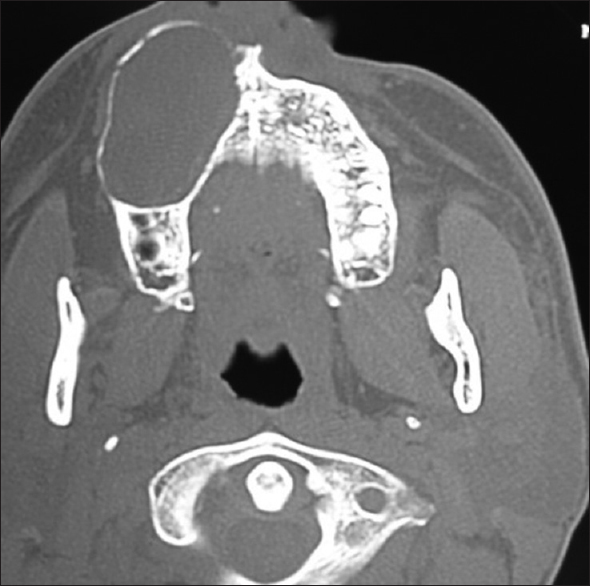 Adenomatoid odontogenic tumour (adenoameloblastoma). Case report and review of the literature. Aust Dent J 1997;42:315-8. White SC, Pharoah MJ. Oral Radiology: Principles and Interpretation. 7th ed. St. Louis, MO: Mosby/Elsevier; 2014. Lee JK, Lee KB, Hwang BN. Adenomatoid odontogenic tumor: A case report. J Oral Maxillofac Surg 2000;58:1161-4. Varkhede A, Tupkari JV, Mandale MS, Sardar M. Odontogenic tumors: Review of 60 cases. J Clin Exp Dent 2010;2:e183-6. Bravo M, White D, Miles L, Cotton R. Adenomatoid odontogenic tumor mimicking a dentigerous cyst. Int J Pediatr Otorhinolaryngol 2005;69:1685-8. 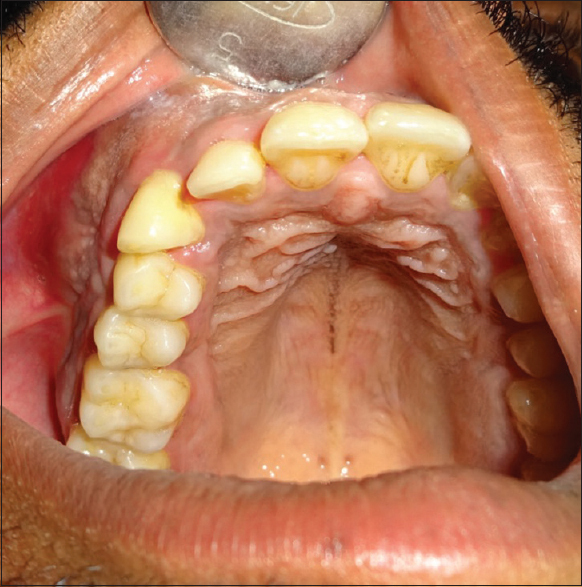 Batra P, Prasad S, Parkash H. Adenomatoid odontogenic tumour: Review and case report. J Can Dent Assoc 2005;71:250-3. Kramer IR, Pindborg JJ, Shear M. World Health Organization international histological classification of tumours. In: Histological Typing of Odontogenic Tumours. 2nd ed. Berlin: Springer Vering; 1992. Takeda Y, Kudo K. Adenomatoid odontogenic tumor associated with calcifying epithelial odontogenic tumor. Int J Oral Maxillofac Surg 1986;15:469-73. Reddy Kundoor VK, Maloth KN, Guguloth NN, Kesidi S. Extrafollicular adenomatoid odontogenic tumor: An unusual case presentation. J Dent (Shiraz) 2016;17:370-4.